Drilling Distance Setbacks | Texland Petroleum, L.P. The City of Lubbock’s drilling ordinance provides a 300 foot buffer between any existing building and a drill site location. The resulting area excluded by this ordinance is a 6.5 acre circle surrounding any building within the city limits of Lubbock where drilling is not permitted. The City Council is currently considering a 1,500 foot buffer from any building within the city limits and a drillsite location. The resulting area excluded under this proposal is a 162.3 acre circle surrounding any building within the city limits. The City Council is also considering setbacks of 1,500 feet from property lines. This would limit drilling to one pad site in the center of a completely undeveloped property that is 3,000 feet x 3,000 feet, or at least 206 acres in the shape of a square. This provision would effectively prohibit drilling even from the middle of undeveloped farmlands as shown. Other cities in the State of Texas have settled on setbacks ranging from none (Andrews), 150 feet (Odessa), 400 feet (Houston), and 500 feet (Midland). 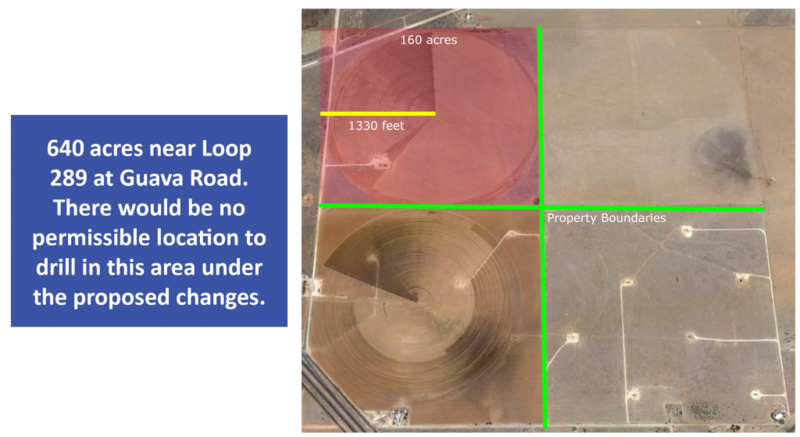 The current 300 feet buffer in the Lubbock ordinance would appear to fall within a reasonable range of current setbacks in place.